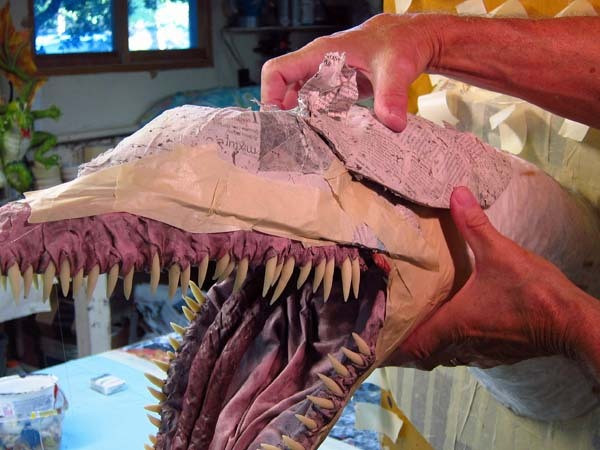 ← Don’t buy this Paper Mache book if…. Hi everyone. Well, I’ve been very busy. 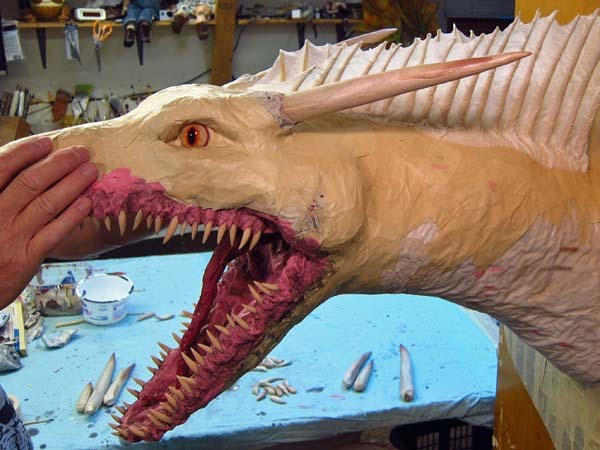 But I got some work done on Drogon. In the last post I added the jaws. 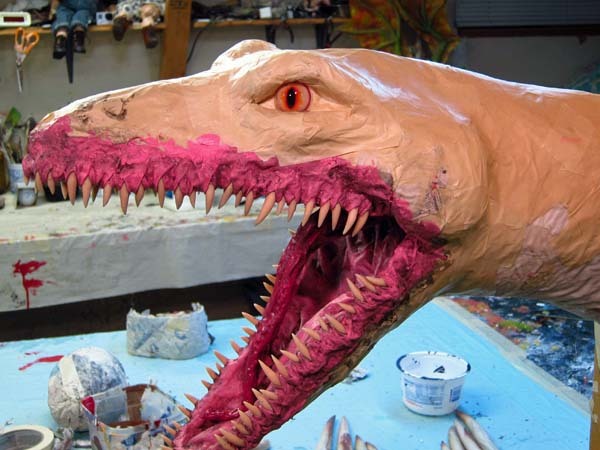 As always, I used paper mache shells to build the face. I cut off a large piece from a paper mache ball and put it on the top of the head. Then I used another piece of shell to fill in some gaps. 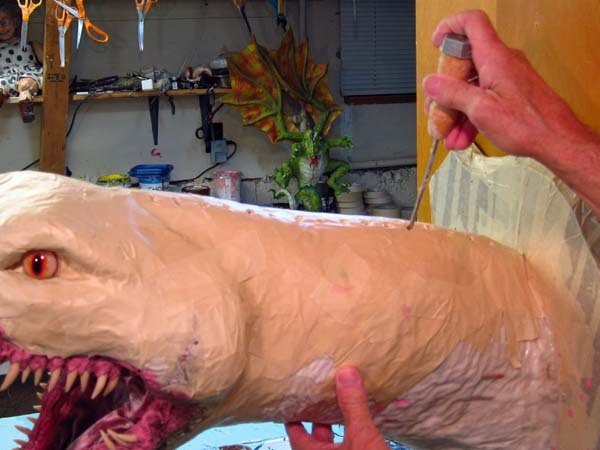 And I used more pieces to add some bulk to the back of the jaws. I added some eyes. Then I twisted some paper and wrapped tape around it which I fashioned into brows. I did the same for cheeks. I wanted some webbed spines. In fact, I wanted a pair of them running parallel to each other down the neck. 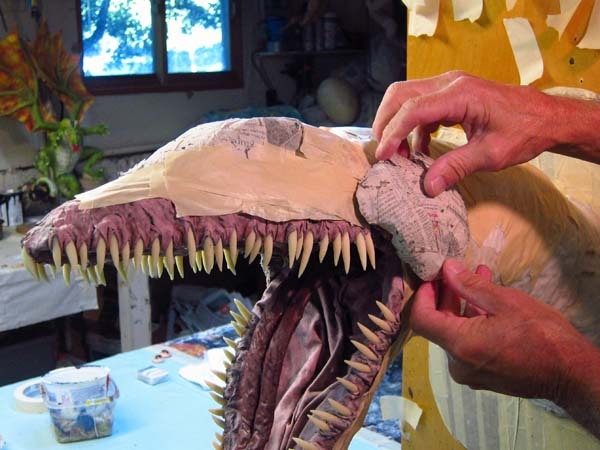 The Drogon in “The Game of Thrones” TV series had dual, webbed spines just like this. I made the spines by twisting paper around pieces of wire clothes hangers and wrapping them with masking tape. I poked holes along the neck with an ice pick for the spines. 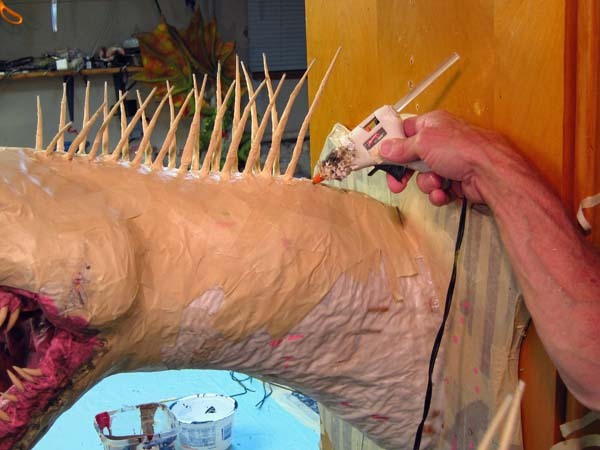 I squirted some hot glue into the holes and inserted the spines. Then I draped some cloth between the spines on one side, and then the other. After they dried I cut some scallops between the webbing. I think the flared spines give this dragon a really fierce look. Or, they will by the time it’s finished. 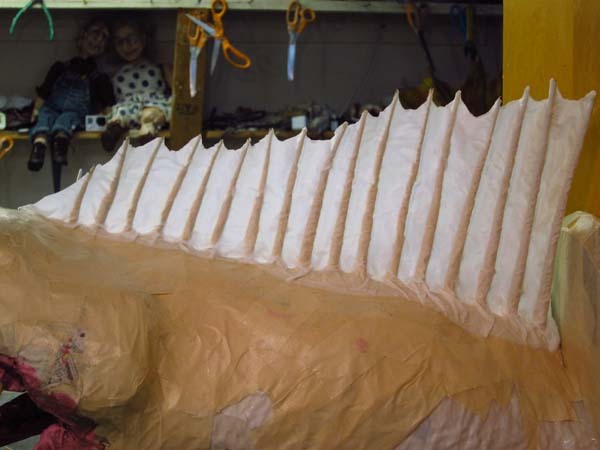 Time for the horns, the most prominent feature of this dragon. I started with the long ones. More to come. I’ll stop here. Thanks for stopping by! 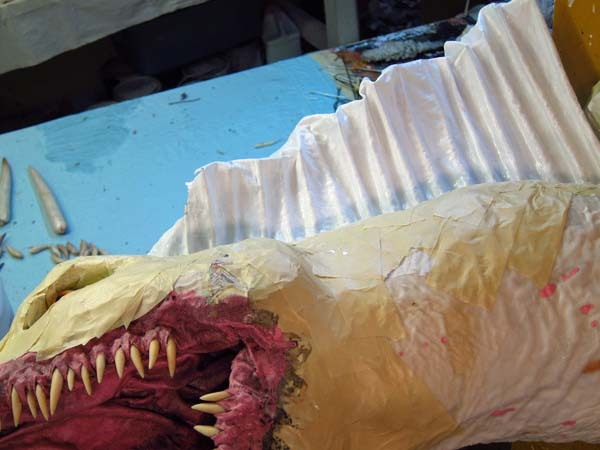 This entry was posted in Paper Mache Drogon- Young Adult Version and tagged dragons, fantasy, Game of Thrones, I love Daenerys, paper crafts, paper mache, paper mache instructions, paper mache recipes, papier mache, sculpture. Bookmark the permalink. It’s looking fantastic, as usual Dan! Can’t wait to see what other horns you will be adding. 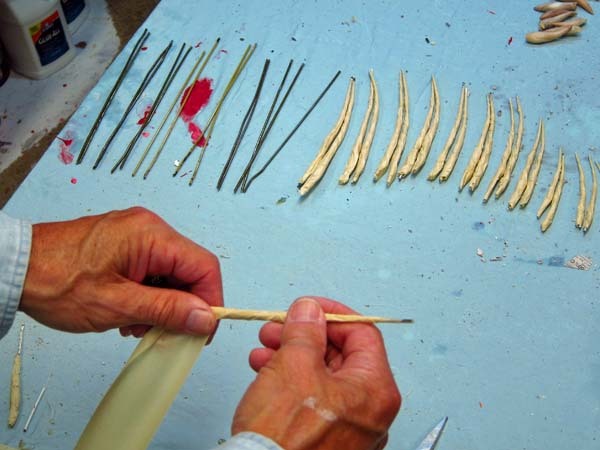 Are these long ones, solid Fimo? Hi Sue. Glad you think this is coming along well. My wife was surprised when she saw me working on another trophy. I just wanted an older Drogon in anticipation of the new season of “Game of Thrones”. But I guess I’ll have to make something else soon. Thank you for hanging in with me. Nice! I love how this project is coming along, and the horns are looking great. Thanks Stella! I do love these trophies. I’m going to force myself to do a non-dragon project soon. See you. Dan, you’re a magician! Watching the life forming under your hands is breathtaking! Thanks Carol! You are really sweet. Glad you like this one. Hello! 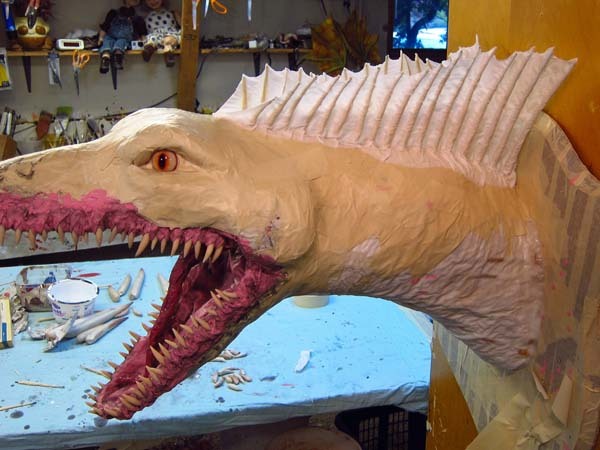 I am a character artist for video games and I sculpt with mostly water based clay in my spare time. 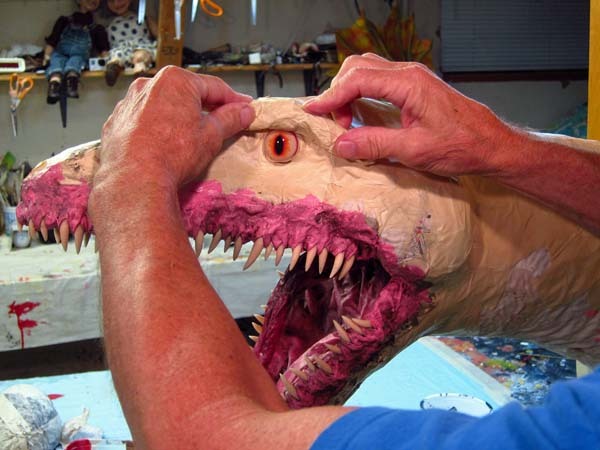 I love your work, now I just have to make a paper mache dragon (or a tiger). Question: how do you make the eyes, do you buy pre-fab glass eyes or cast them yourself from resin? Thank you! Hello Tatiana. Thank you! Most of the time I buy taxidermy eyes. They are glass and beautiful. If you Google, “glass eye taxidermy” you’ll find all the companies I use. They all sell slightly different kinds of eyes. Good luck with your work! Muito bonito seu trabalho, o mais impressionante que eu achei foi o great dragon e estou tentando reproduzir um parecido com esse, mas estou com algumas dificuldades, fiz as formas iniciais do pescoço e da cabeça mas não ficou muito simétrico, alguma dica de como posso faze-lo ficar com o formato simétrico? outra duvida também é sobre os olhos, do que são feitos e onde posso encontrá-los, procurei olhos para taxidermia na internet mas não são os que eu queria no meu dragão de papel machê. Os dentes, estou fazendo com jornal e fita como você faz no vídeo com os chifres e estou cobrindo com massa de biscuit. agradeço sua atenção, caso tenha alguma dica para mim e meu projeto que foi inspirado no seu trabalho me mande um e-mail papazoti@gmail.com espero ansioso por sua resposta. Olá Pablo. Eu uso um tradutor e eu não tenho certeza que eu entendo as suas perguntas. Vou tentar responder. Sobre simetria, às vezes você tem que cortar e moldar as peças até que você consiga simetria. Eu uso taxidermia olhos. Eu não saberia por onde começar olhos diferentes. I fazer dentes de polímero argila. Brands incluem Fimo e Sculpy. Hola Dan, una pregunta, donde puedo conseguir ese tipo de cuernos? I made the horns out of Fimo. Te queria hacer una pregunnta, que truco usas para cortar muchos triangulos de tela a la vez? la doblas de alguna manera en especial? poruqe no creo que los cortes uno a uno verdad? Dan, you’ve inspired me to try my hand at an art project. I’m not skilled at this type of stuff, but with practice, who knows? I have a couple of questions I was hoping you could answer for me. What size are the eyes you are using? I’m seeing 16mm, 25mm and 30mm among others. How long does it take to create something like this (not including the time when life gets in the way ;))? Thanks for sharing your talents. I hope my upcoming experience leads to a lifelong hobby. Hello Joel. I’m happy you are interested in my methods. I use all of those size eyes. It depends upon the piece. I get the eyes that I think look best given the size and project. I tend to use the bigger ones, 25+ mm for trophies. But I use very small eyes sometimes for a particular effect. Other times I use eyes that seem too large. Here is something I used to us to decide before I bought eyes. I would just make circles out of cardboard and color in the iris’. I would tape them in place just to get a sense about size. Then I would buy that size. I say “used to” because now I have extra eyes of all sizes laying around that I use in the same way. I put them on temporarily to see how it looks. It can take a 3 weeks to a couple months to build a piece. Once again, it depends upon the size and complexity of the piece. No two projects are the same. Sorry, that probably isn’t much help.